Nitrogen testing involves preparing the hose assembly for testing by making sure the hose assembly is completely sealed. The assembly is connected to the test rig via a flexible hose one end and the other end of the hose will have a valve attached to release the nitrogen slowly and safely once the test is complete. The hose is then filled with Nitrogen and submerged under water in our custom built bath, and taking it to a specified test pressure. The hose will be held at the desired pressure for no less than 5 minutes depending on the customer requirements. 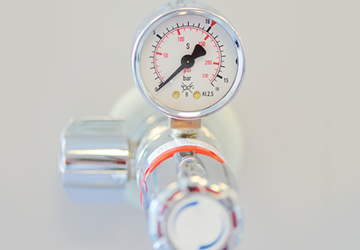 Check the pressure gauge regularly over the testing period and carefully observe the hose to see if any bubbles emerge, this would indicate whether there is a leak. Our highly sensitive tracking equipment will also be used to check for any drops in pressure. Once the allotted test time has been reached the hose assembly will be released of pressure and the hose will be disconnected from the test rig. Every hose that passes the pressure test will be labelled and a report will be completed, if the customer requires one. Any hose that fails will be segregated and reported to the customer. Testing with other gases is also available.